A big thing I’ve noticed amongst fitness enthusiasts/professionals like myself is the pattern of modalities one seeks to the next. A great example is many who are into kettlebells…eventually find steel maces in the process. Then a couple months later with steel mace training — it’ll be no surprise you’ll start noticing steel clubs. Why? Simple answer is we naturally gravitate toward challenging ourselves with different and yet similar tools that are alike with ones were experienced with. 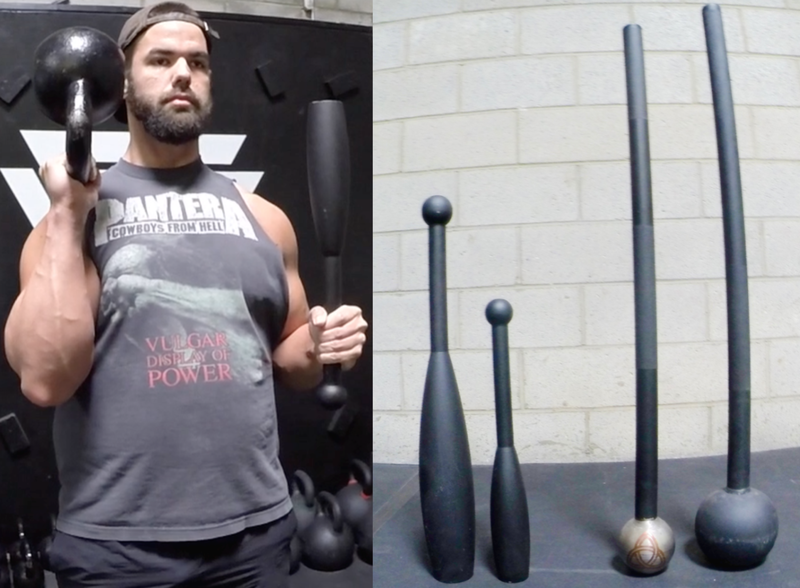 So if you’re into bottoms up kettlebell exercises; you’ll find ALOT of the same effects with steel clubs due to the elongated loaded shape being balanced over the wrist. Clubs also share the same characteristics of a steel mace with both being asymmetrically loaded to one side, but with a shorter handle. This in turn challenges your grip strength unlike any other tool. However, when I got into steel clubs 4 years ago — I was confused on where to start with weights, the best exercises, and the workout programming for it. This is why I wanted to type out this beginner guide for those with a increasing interest for steel clubs and answering these common questions. It’s also why I’ve made detailed educational videos to better explain how steel clubs can better integrated into your strength training — let’s get started. What are steel clubs and what weights are best? What are the best exercises to start out with? When I first introduce steel clubs to a beginner, my automatic go to exercise are two handed (2H) pullovers to pressouts. The reason being is it’s the best exercise to teach how the steel club’s weight distribution works and teach the safety standard of the side stack position. While steel clubs are lot like maces, we do NOT want to vertically stack the club in the midline of the body like a steel mace. When the club’s short handle stacks in the midline of your body — it’s weighted end is now near your face. So foundational movements like the pullover can turn into a serious bang in the head. So to simply prevent that from happening, we want to SIDE STACK the club to one side and then perform the next (top middle). When set up in the 2H side stack position, you want think about keeping your body vertically planked and pack the shoulders down & back into the lats. Not many know about the lats, but they are the giant muscle wings of your back and can not only protect your shoulders, but give instant strength (if engaged right). This is extended into the pressout by keeping your elbow pits externally rotated up to keep the lats engaged. If the elbow pits rotate downward (bottom right in picture above), then the traps get more involved and impinge the shoulder girdle and result in poor strength output. So think you want to “break the bar” to emphasize this when the arms are fully locked out. If you have strong glutes, you’ll have a stronger low back — then in relation if the lats are strong…the shoulders are stronger. 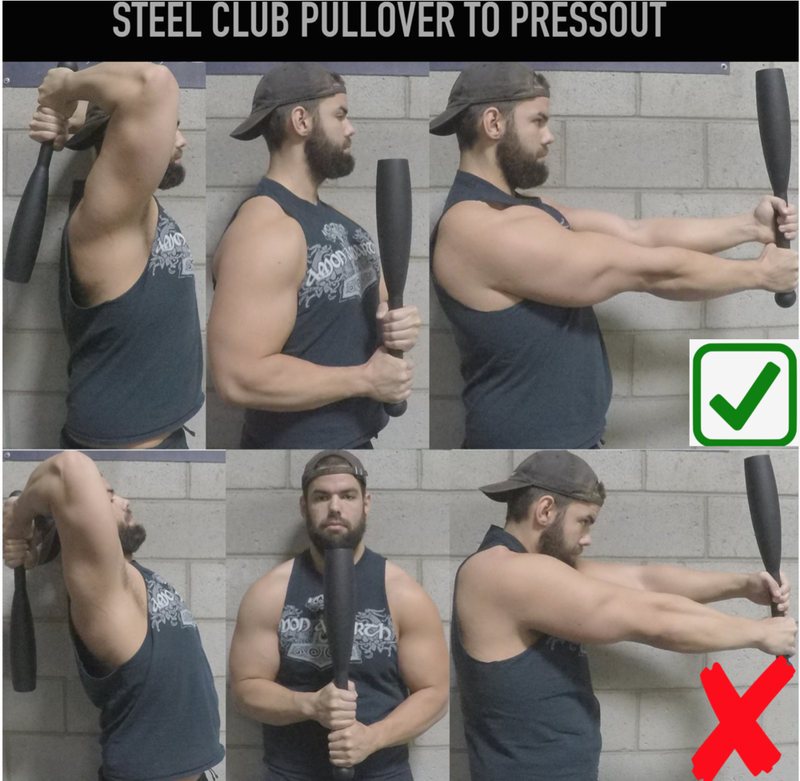 What’s a good beginner workout with the steel club? So if you liked what you read and want to progress your skills with steel clubs — checkout my brand new ebook program GADA Club: Guide for Indian & Steel Club Strength Training on sale now and can be purchased HERE. It features 30 different indian club warm up drills before you get into the strength training with your 40 steel club workouts. If you’d like to know more about indian clubs, I also wrote another article on them HERE. I hope I gave you a better understanding about steel clubs and what they can offer for your fitness regimen. If you have ANY more questions about them — feel free to send a private email by contacting me HERE.